Apidexin Review: Is it Safe? Apidexin is a diet pill that offers a weight reduction system, calling itself "The #1 Diet Pill 3 Years Straight". The product claims to work by burning fat and boosting metabolism, offering visible results fast. Moreover, the product states an entire research and development team backs Apidexin, making it the strongest fat burner around. But does the product work? Our team of research enthusiasts are entirely dedicated to keeping our eyes and ears on the diet supplement world to bring you only the best reviews. So let's take a closer look at Apidexin and see what we can find. 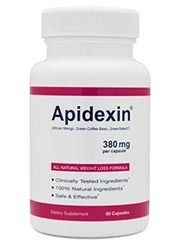 Apidexin is a fat burner that supposedly works primarily due to its main ingredient, Irvingia Gabonensis. This ingredient is found in a tree native to West Africa, of which its seeds are used to make medicine and lower cholesterol. But does Irvingia Gabonensis work for weight loss? We were surprised to see that Irvingia Gabonensis doesn't quite have the high ratings that Apidexin claims it does. According to WebMD, Irvingia Gabonensis has no sufficient evidence proving its effectiveness for weight loss. Although some small studies show some correlation to weight loss, WebMD calls these tests of "poor quality" and additionally states that a low calorie diet is also necessary. Hardly an effective primary ingredient. But how about the other ingredients that Apidexin uses? Disappointingly, the only other somewhat effective ingredient in Apidexin is caffeine anhydrous, or in layman's terms - the powdered version of regular caffeine you would find in a strong cup of coffee. In so far as the other ingredients like cissus quadrangularis, alcehmilla vulagaris, olea europaea, cuminum cyminum, mentha longifolia, etc., etc. - all of these are merely common herbs that although beneficial for mild medicinal purposes, have little significant effect on weight reduction. Additionally, Apidexin originates from Gadd Formulas LLC - a company based out of Utah. Unfortunately, there are a number of complaints regarding this company. For one, there is no contact address aside from the fact that this place is located in Utah. Furthermore, there are plenty of disgruntled customer reports about being unable to get a hold of customer service representatives, and despite offering a 90 day money back guarantee we also discovered that Gadd Formulas LLC has more than one write up on the Ripoff Report. Although Apidexin makes very bold claims having to do with its effectiveness, and offers graphs showing its clinical studies, etc., etc. - the facts are simple: not nearly enough legitimate studies exist proving the effectiveness of Apidexin's main ingredient, Irvingia Gabonensis. Furthermore, the product contains a fair amount of caffeine, which coffee drinkers and non coffee drinkers alike should be wary of as this may cause a spike in anxiety, jitteriness, palpitations, and insomnia - not to mention Apidexin is certainly not cheap either! And lastly, the company behind Apidexin, Gadd Formulas LLC, greatly struggles with its customer support division (failing to return customer calls for example) and has received several write-ups on the Ripoff Report. In our team's recommendation, the consumer would greatly benefit from other products that offer sound customer support, a cheaper product, and proven ingredients that will effectively by and large help you lose weight. Bottom Line: Apidexin makes tremendous claims but largely fails to deliver by selling unproven ingredients at a high price and with minimal customer support.